Fine Signs & Graphics : Hot Air Ballooning : Want To Ride? Peaceful, dreamy, romantic, adventurous...all words our passengers have used to describe a balloon flight with Images Aloft. In From ages 8 to 80, we’ve taken our guests on the ride of a lifetime. 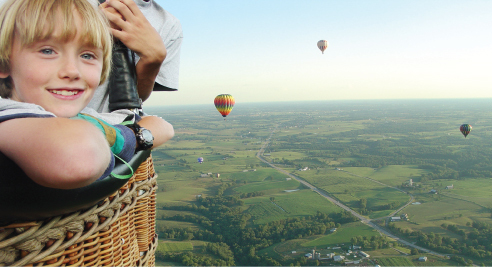 The world looks different from the basket of a hot air balloon. Some say it feels as if the balloon was perfectly still and the earth was passing by beneath you. Sounds on the surface such as barking dogs and laughing children can be heard quite well at 1,000 ft. It is an experience you won’t soon forget! 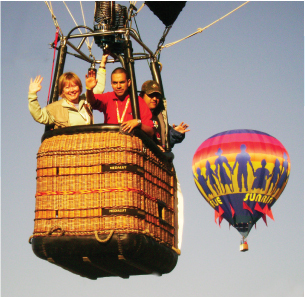 A balloon ride is the perfect experience to celebrate a birthday, anniversary, or even a marriage proposal. We have had weddings performed on board the balloon! A handsome gift certificate is available. We fly all year long, although most passengers choose to fly in the spring or summer. Fall foliage flights are very special...don’t forget your camera! 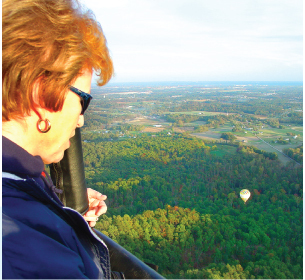 Take an introductory lesson with one of our FAA certified flight instructors, and get a hands-on experience in the old-world art of hot-air ballooning. 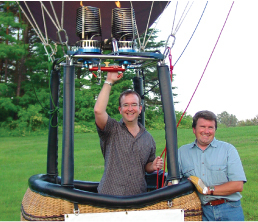 Like any aircraft, balloons are federally registered and licensed, as are the pilots who fly them. To qualify for the balloon pilot’s license with the Federal Aviation Administration, the student needs 10-15 flights with an instructor. We teach all the basics of take off, level flight, landings, and safety procedures with an FAA approved syllabus and lesson plan. Weather, aviation law, and ballooning theory are an important part of pilot training. We offer training in our balloons or yours. It is a distinct privilege to become licensed pilot, and it may be easier than you think.